Senior Awards Night is on May 15 at 6:30pm in the MPR. We would love to recognize all seniors who have earned scholarship money. Please have your senior bring in copies of his or her award letters (physical or email versions) so he or she can be recognized. This includes all scholarships earned, whether or not your student is attending the school or accepting the scholarship. The senior class is currently at $5 million in scholarship money and we would love to beat the Class of 2017, which earned $9 million last year! The due date for award letters to be turned in is May 4 in order to guarantee recognition at Senior Awards Night. Thank you for your help as we recognize and congratulate the Class of 2018! The Class of 2018 will graduate on Saturday, June 2. Here is some important, high-level information. Be sure to click READ MORE for important details or refer to the email communication sent Friday, April 13. Each graduate receives 8 tickets and up to 10 additional tickets can be purchased at $10/each using the 2018 LNC Graduation Ticket Request Form. Grads will receive tickets once all school items are returned and any financial obligations are met, i.e., laptop and cords, parking pass, etc. Graduation Rehearsal is Friday, June 1 from 9:00am-12:00pm at the Park Church. Graduates must be present and on time at rehearsal to participate in the Graduation Ceremony. Our graduation is a formal occasion so please dress accordingly. Wear an appropriate dress, dress pants with blouse or skirt with blouse paired with dress shoes or nice sandals OR wear a white-collared, button-up shirt with a tie along with dress pants and dress shoes. Flip flops and tennis shoes are not permitted. BRING SHOES TO REHEARSAL TO PRACTICE IN THEM. The graduation ceremony is Saturday, June 2 at 9:00am at the Park Church. Because parking at the church is limited, graduates are not allowed to drive themselves to the church and park in the church parking lot. Upon arriving, graduates will report directly to the gym. Doors to the church will open at 8:00am, and guests who have tickets will be able to enter at that time. All guests must have a valid ticket to enter the ceremony. Traffic on Beatties Ford Road near the church becomes very busy leading up to the ceremony, so guests should allow plenty of time to arrive, park and be seated prior to the 9:00am start. Once the graduate processional begins, no guests will be allowed to enter the sanctuary until AFTER the processional. St. John's Photography will be on our campus Wednesday, July 25 and Wednesday, August 1 from 9:00am to 12:00pm to take senior pictures. Please save the date for one of these two days to have your student's senior pictures taken. Be on the lookout for more information to come, including a link to sign up for your preferred date. Interested in HS Cheer for the 2018-2019 season? We would love to have you attend try-outs to continue our tradition of excellence. Try-outs will be held the week of May 14-17 after school from 3:00-5:00pm. Please visit our cheer website for more information and to fill out the google form for try-outs: http://lncscheer.weebly.com/try-out-information.html. We hope to see you there! Thank you to Davidson College for inviting Melissa Smith's AP Literature students to a private Q&A event with author and social activist, Clint Smith. Students who were able to come (it was during spring break) along with English students from Davidson and Livingstone Colleges, had the opportunity to ask him questions in a smaller setting. Afterward, Mr. Smith signed our copies of his book Counting Descent, which was read in class as part of the summer reading assignment. Mrs. Smith's class had already Skyped with him in the fall, but now students were able to meet him in person! Later that same day, many LNC students attended an open-to-the-public poetry reading, also held on Davidson's campus. 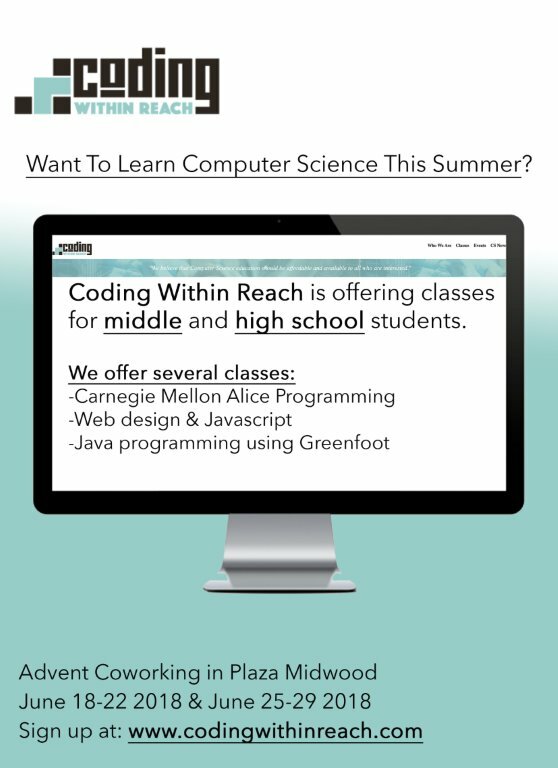 Coding Within Reach is offering summer camps for students looking for more opportunities to learn coding. Please click here to view the flyer and how to register for summer camp.